Sometimes flowcharts need to be presented in MS Word document. Then how to export a flowchart to Word becomes important. This page shows the way to get a flowchart to MS Word. A flowchart is a graphical diagram that can help us to better understand a complicated process. You can use Edraw to create a flowchart with all kinds of shapes, symbols and templates provided. 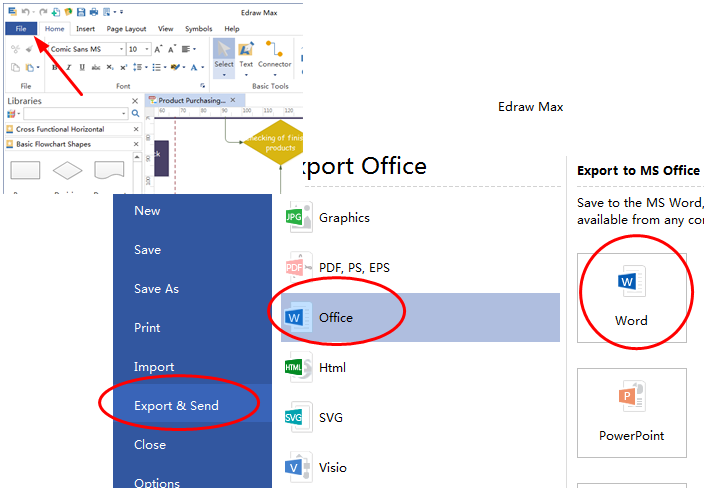 With great compatibility, files in Edraw can be exported to MS, such as Word, Excel, PPT, etc. For better services to users, all files (Flowcharts included) can be converted into MS Office. 1. Create a flowchart you need with Edraw. If your time is limited, various of flowcharts examples are pre-made for you. 2. Once you are done designing your flowchart, click on button "File" (As shown in upper image). Then click on button "Export & Send", you will get several options. Follow the lead of the red ovals and click on button "Word", you will get your flowchart successfully exported. Please remember your output path in case you cannot find your exported file. The shape sizes and colors can also be modified in MS Word. 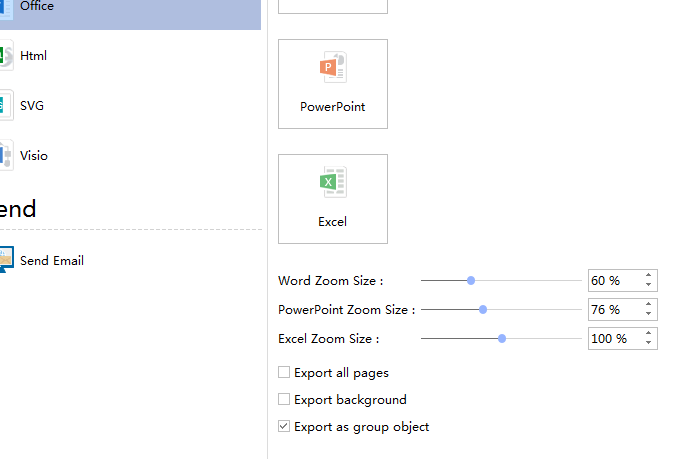 While exporting flowchart, you can set the zoom size of the exported word document. You can select to export all pages, export background or export as group object. Export all Pages: Tick this option all pages will be exported to Word. Export background: If you choose this option, the background of your drawing will also be exported to Word. Export as group object: By ticking this option, you can choose to export only the selected part of your drawing.